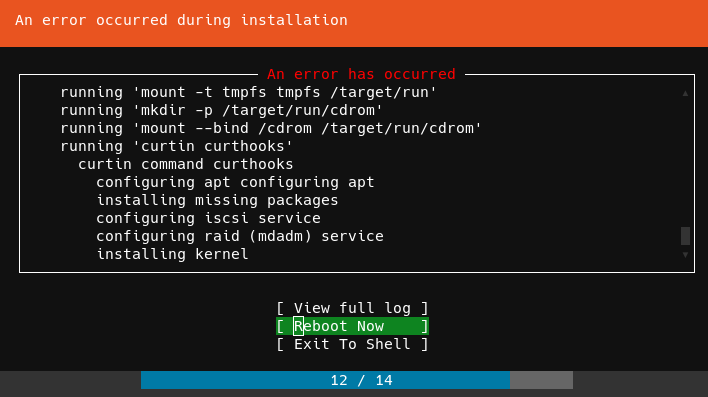 When subiquity encounters a problem the user is prompted to either view the full installation log, reboot, or exit to a shell (see attached screenshot). Selecting "Exit To Shell" brings to a login prompt instead of executing a shell. It is unclear if a valid username/password pair exists and allows to actually login. [FAILED] Failed to start Create System Users. When given the "Exit To Shell" login prompt no reasonable default username/password pair works, so it *may* be that a default user hasn't been set up. which is the subiquity version of the original issue. The problem affects serial terminals, and the reason is that serial getty it not configured for automatic login unlike regular getty. It is possible to log in with username 'ubuntu-server' and no password.